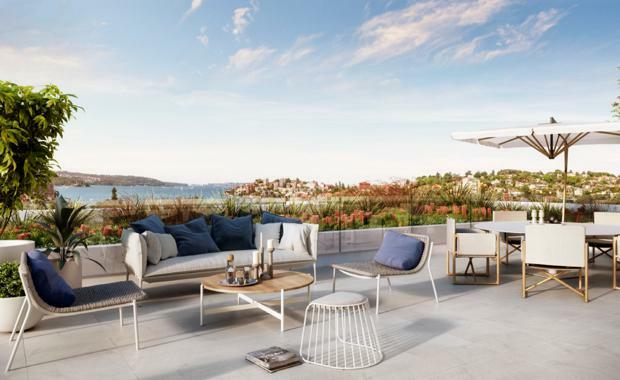 Golden Age Development Group has set its sights on young professionals living in Double Bay, with the launch of a new apartment complex in New South Head Road. The Essence development will offer 37 apartments over two four-storey buildings at 315-321 New South Head Road, opposite the Double Bay village centre. Sydney architects, a+ Design Group has designed Essence and Car Design Group has designed the interiors. Essence will feature articulated facades in granitised render, steel and aluminium with large balconies and terraces. Most of the apartments have a northern orientation and leafy outlooks while apartments on the top level of the two buildings will boast views overlooking Sydney harbour. 321 New South Head Road is a smaller building with a maximum of four apartments per level. The top level has a two-bedroom penthouse apartment looking out to Double Bay. The apartments range from studio apartments, to one-bedroom apartments with living areas of 45-66dsqm ($890,000 -$1.37 million), two-bedroom apartments of 74-104sqm ($1.595 million - $2.496 million) and three bedroom-penthouses from 94sqm to 200sqm ($2.1 million to $7 million). Many apartments have a pair of terraces and outdoor space ranges from eight to 60 square metres. Essence’s two buildings at 315-317 and 321 New South Head Road will feature landscaping designed by Julian Brady of Site Design Group. Mr Brady was formerly general manager of Jamie Durie’s landscape architecture firm Patio. Interested buyers will be able to visit at the official launch at the InterContinental Sydney Double Bay for one weekend only on March 12 and 13. Construction is scheduled to commence in mid 2016 with completion in late 2017.